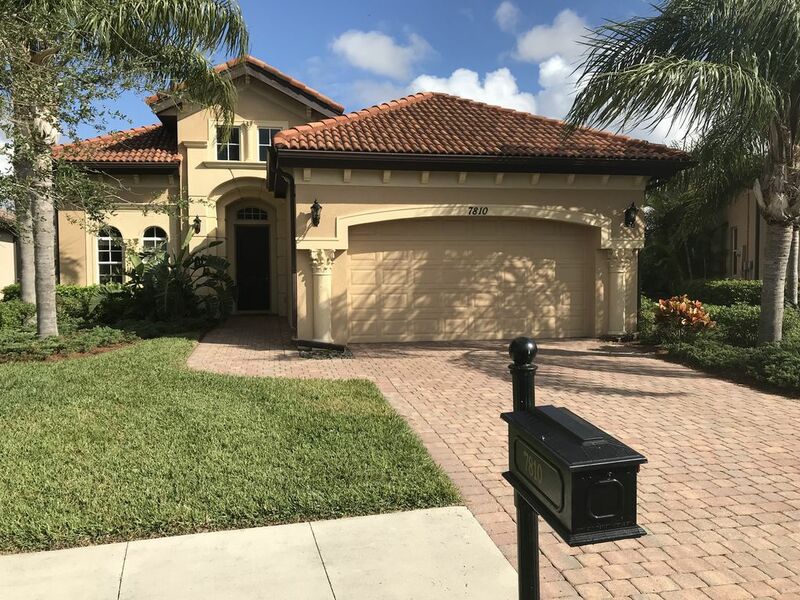 Our Single family home is located in the quiet gated community of Ashton Place in Lely Resort. This three bedroom, two bathroom house also includes a formal dining room, a den/office and a two car garage. My favorite feature of the house is the great room. It includes an open kitchen, living room and breakfast nook (round table with 6 chairs). The house ceilings are high and some have a lighted tray ceiling. The house has a built in intercom system that can be used to answer the front door or play music from the radio through out the house. Many exceptional golf courses are within 10 miles of the house. There are three golf courses in Lely resort: The Classics(private course), the Mustang (public), and the Flamingo (public). The house is on the fairway of 11th hole of The Classic's golf course. Enjoy your morning coffee while you watch the golfers by your private pool in the fully screened in lanai. The lanai enclosure features your pool with easy entry steps and sitting platform. The Jacuzzi sits beside the pool and can create relaxing water fall into the pool. Both pool and Jacuzzi can be heated to your selected temperature. Lounge chairs within the lanai can help improve your tan. A propane gas grill is also within the lanai beside a 6 person patio table and an outside mounted flat screen television. The home is just minutes from the Gulf of Mexico sandy beaches for ocean activities such as: fishing, boating, snorkeling, swimming, deep sea fishing, etc. The house is located directly between Marco Island and downtown Naples. The area features some fantastic restaurants and shopping. Want to try something different, try an airboat ride through the Florida everglades, just south or visit the Naples zoo. Do you need time to catch up with friends. The house has free wireless internet. Do you need to catch up with the office, or print your boarding pass, the Den has a desk and laser printer/scanner along with the cables necessary. Don't want to go far? Lely's 26,000 square foot Player Club and spa is within walking distance. It has a lap pool, a large kiddy pool and a large fun pool with water fall. It has shade or sunny areas, sand or cement areas, whatever you prefer. The fitness center, spa, basketball courts, sauna, and tennis courts are available. Try the pool side Tiki bar and grill or Wednesday pasta night in the main dining room. Just for fun, my husband and I enjoy scenic walks thru beautiful Lely Resort. There are also two bicycles in the garage, when we want to go a little further. We enjoy our home and hope you will also. If you plan to have little ones at the house, please ask us about our baby and toddler items such as: rock n play, pack n play, highchair, toddler bed and toys. Sheets, Blankets, Comforters, Pillows, Pillow cases, Mattress Pads Kitchen linens dish towels, placemats etc. Beach Towels. Bath towels, Hand towels, Wash Cloths etc. are provided. Large Television in living room, another in Lanai and one in each bedroom. The pool has easy entry steps and a pool shelf. The deepest part of the pool is approximately 6 feet deep. The pool can be heated with the hot tub. Instuctions for operation are provided in the house.